Croi Report Shows Heart Disease Prevention Makes Cents! A report published today in Galway, Thursday September 29th, (World Heart Day) by the National Institute for Preventive Cardiology reveals that pioneering work being undertaken by the Heart & Stroke Charity Croi in preventing heart attacks and strokes is not only delivering significant health benefits but is also proven to be cost effective and cost saving. The Croi MyAction Programme which has been up and running for the past 5 years in Galway is a gold standard chronic disease prevention programme, designed and delivered to achieve the latest European Society of Cardiology (ESC) guidelines for risk reduction. To-date, over 1,100 west of Ireland people (617 high risk individuals and their partners) have benefitted from this community based prevention programme and the results of this work make a compelling case for Irish health service investment in prevention. An independent health economic evaluation funded by Healthy Ireland and conducted to assess the costs and benefits of the Croi intervention convincingly demonstrates that the programme delivers value for money with every €1 invested generating on average €8 in benefits -demonstrating for the first time in Ireland that prevention does work and investing in prevention can deliver economic as well as health gains. 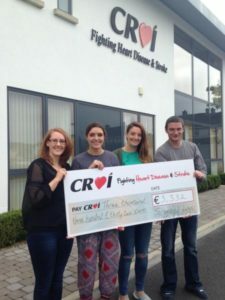 Since the programme was established in Galway in 2009, Croi has invested over €700,000 ( largely funded through the charity’s own fundraising efforts) in delivering the 12-16 week intervention ‘free of charge’ to those who most need it and the evidence now shows that this investment has yielded benefits in the order of €4.8m. The report shows that the Croi programme beats usual care by delivering both improvement in life-years gained and significant health cost savings. The Croi prevention programme which is uniquely a community based, family centred intervention delivered by a multidisciplinary team (nurse specialists, dieticians, physiotherapist/physical activity specialist and physician) is an intensive lifestyle and risk factor reduction programme where all patients and an accompanying family member are assessed at the start of the programme, on programme completion and again at 1 year. A smoking quit rate of 51% , the impact of which equates to a 50% reduction in cardiac events. Greater adherence to the ‘Mediterranean Diet’ which is directly linked to a reduction in risk of heart attack and stroke. An increase in physical activity targets from 13% to 52% which equates to upwards of a 30% reduction in cardiac events. An increase in achievement of recommended blood pressure targets from 55% to 74% which yields a 20-35% reduction in heart attack and stroke. ** All these outcome measures are obtained by objective measurement eg: blood tests, functional capacity test, BP measurement, smoke check carbon monoxide test. The Galway programme was recently selected as Ireland’s exemplar of best practice in chronic disease management and recommended to CHRODIS, a European platform that aims to identify, exchange and disseminate good practice in chronic disease management across Europe. Croi, the west of Ireland Cardiac Foundation was established in Galway in 1985 and since then has been leading the fight against heart disease & stroke in the west of Ireland. 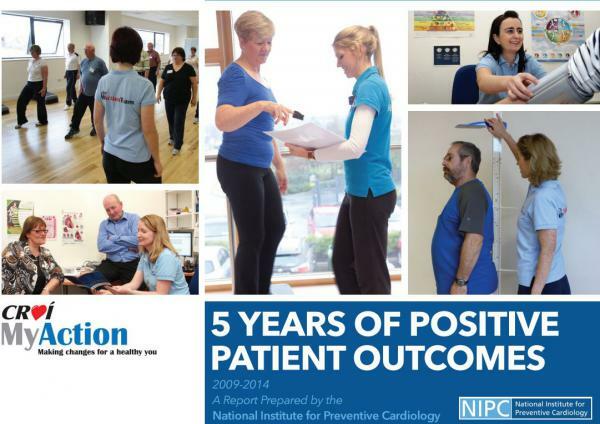 In 2012, the Foundation opened the Croi Heart & Stroke Centre in Galway, being the first centre of its kind in Ireland dedicated to the development and testing of cardiovascular disease prevention initiatives and the promotion of recovery & wellbeing. In 2015, there were 26,406 visits to the centre and almost 12,000 individuals provided with health support through a wide range of training and education programmes across the region. The National Institute for Preventive Cardiology was established by Croi as an affiliate of NUI Galway in 2014. The Institute aims to produce a new generation of scholars and leaders in cardiovascular health and disease prevention. The NIPC provides a portfolio of educational and training programmes in the prevention and control of heart disease, stroke, diabetes & obesity. This portfolio includes programmes designed specifically to meet the needs of the healthcare workforce in terms of continuous professional development including a range of formal postgraduate qualifications. Posted in NewsLeave a Comment on Croi Report Shows Heart Disease Prevention Makes Cents! Already many local businesses have committed to participate in this novel health promotion activity aimed at raising awareness of how easy it is to take exercise in the normal working day. 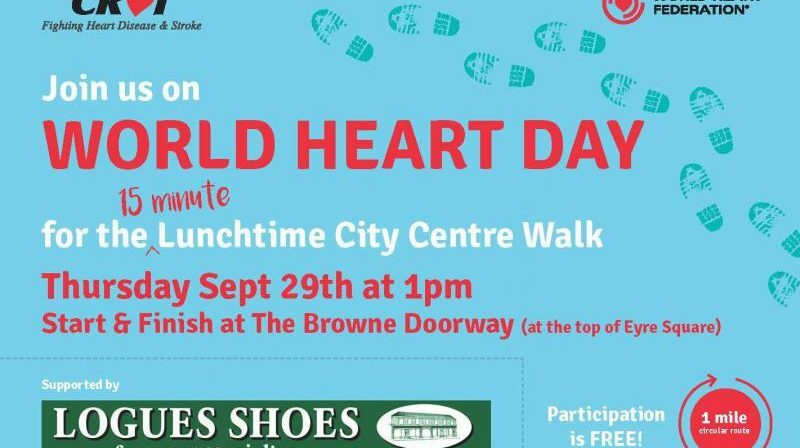 The ‘15 minute’ World Heart Day Lunchtime City Centre Walk will start and finish at the Browne Doorway (at the top of Eyre Square) leaving at 1pm. 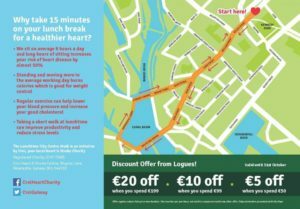 The walk route is exactly one mile through William Street; Shop Street; High Street; Quay Street over Wolfetone Bridge and back up Dominick Street; Bridge Street; Mainguard Street; Shop Street and finishing in Eyre Square. Local Shoe Store Logues have partnered with Croi to help promote this novel health promoting event and everyone is encouraged to participate whether its hail, rain or shine. When I first heard about the Croí 'My Action Programme' . I threw my eyes to heaven. The Consultant from the stroke unit at UCHG recommended that I should do this. "Yeah right" , I thought; "not for me". I had been admitted to UCHG following a mini- stroke. I have always believed that I was immortal;that nothing could kill me. I ate what I liked, drank what I liked; I had no real exercise in my daily routine; I was a smoker and I failed to deal with stress in my life. I had an early warning sign about my blood pressure in early 2015 during a pre-employment medical. The doctor told me that my blood pressure was unacceptably high. So I googled this underlying, serious problem. I ignored medical advice as I am after all, immortal. I had what was termed a 'mini-stroke' on 6th July. 2015. I had gone to the smoking area at work that evening at about 6pm. I had had a very stressful experience at around 4.30p.m. As I left the smoking area to return to my desk, I smiled to myself; "You were getting worked up about nothing, Mal; nothing at all". It was then that I found I had a strange sensation on my upper lip. It was as if I had eaten spicy food and had a remnant of cayenne pepper on my tongue. I remember thinking; "I didn't eat anything spicy today – just the usual normal sausage and chips in a bap with coffee and three sugars…what's that all about?". I sat back at my desk and as I began to use the mouse for my PC I found that I had pins and needles in my right hand; the right side of my face felt warm and tingly; an hour later my foot was tingling and my entire right side was becoming numb. It's like that feeling when you wake up after having slept on your arm and the feeling is coming back slowly. I knew that I had a left brain vascular event. But I am immortal. I remember going to evening break, knowing there was something wrong with me, the whole right side of my body was tingling with pins and needles. I remember, over a toasted cheese sandwich telling Mary Higgins about my experience. I remember the expression on her face as I told her. "You need to go to casualty, Mal". I laughed and said "Well I had better phone Maura and get her to lay out my best suit!" She said; "Well you'll only need the jacket" -Why? "Well you might be going someplace hot!" Well it was one of the best laughs I ever had!! So I finished my sweet coffee and biscuits and drove home. Maura drove me to casualty at UCH Galway. -Are you not worried Mal? – I mean about your health? To cut a very long story very short I was sent home with a cocktail of drugs and I became increasingly paranoid about my health. I was re-admitted to hospital in Sept 15 with a suspect heart condition. It was a false alarm. It was during this period that Croí called me and I was having too good a time in hospital; I enjoyed it immensely. I told them to call back later. I remember being a 'public' patient and in a hospital bed across from someone paying thousands a year in private health insurance. We received exactly the same excellent care. I had paid thousands upon thousands myself as an employee for years upon years before I let it go. This story is getting longer as all life-stories do. The Consultant wagged his head at me again and advised me to go on the Croí action programme. Croí called me again and, eyes raised to heaven again, this time I decided to go along with it. Well it was like being woken up from a long sleep! My beloved decided she would come along with me. Therese did my blood tests; Denise assessed our BMI; Rachel assessed our dietary habits. These Three Musketeers changed my life. Eyes to heaven because they are angels! Maura came with me for support. Maura had a more serious stroke about 2014. We came alive in Croí! -"Food Labelling; I'm not going to that class!". It was the food labelling class that was extraordinary. My life has been changed. I exercise more, I get thrown out of supermarkets at closing time for spending too much time reading labels. These Three Musketeers changed my life! Go Therese, Denise and Rachel. Well done to Croi in Galway! 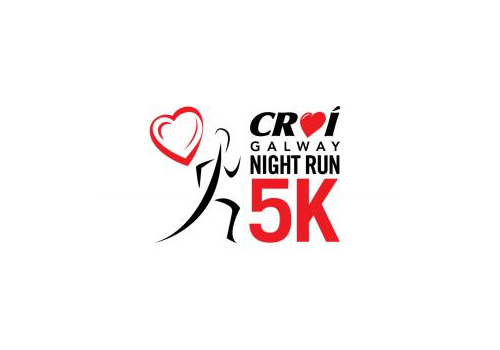 Croi Galway Night Run Register Now!! Posted in NewsLeave a Comment on Croi Galway Night Run Register Now!! Hell & Back for team Scrambled Legs! 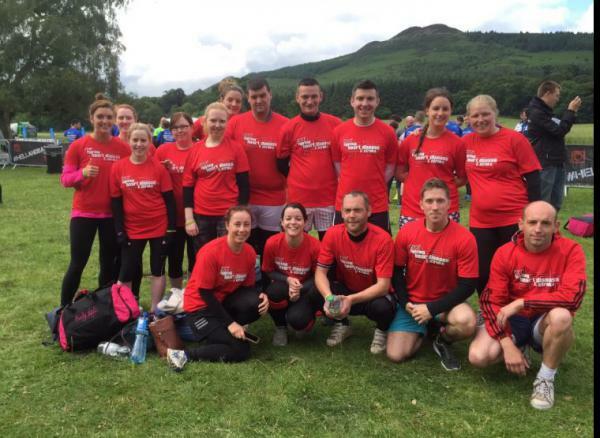 Taking on Hell and Back 2016, Aodhan and 21 of his team mates donned the red shirts for Croi. Hell & Back is an adventure run where participants must complete a 10-15km trail route crossing rivers and lakes, climbing hills and mountains and crawling through bogs and swamps! Aodhan and his team "Scrambled Legs" raised €3,332 for Croi, what a team! Pictured presenting the cheque to Croi were (left to right) Ciara Ni Fhiommagain, Niamh Ni Mhaoileoin, Siobhan Ni Mhaoileoin & Aodhan O' Maoileoin. Posted in NewsLeave a Comment on Hell & Back for team Scrambled Legs! Cholesterol: What is it and how can I manage it? Cholesterol is a fatty substance which is essential for your body to function day to day. A certain amount of cholesterol is healthy as it forms part of the cell walls and is also necessary to make hormones. There are two main types of cholesterol – LDL or ‘bad’ cholesterol and HDL or ‘good’ cholesterol. HDL cholesterol is beneficial to the body. However, if there is too much LDL cholesterol it can be deposited along the walls of arteries, forming atheroma (fatty material) and cause blood vessels to become narrowed or blocked. 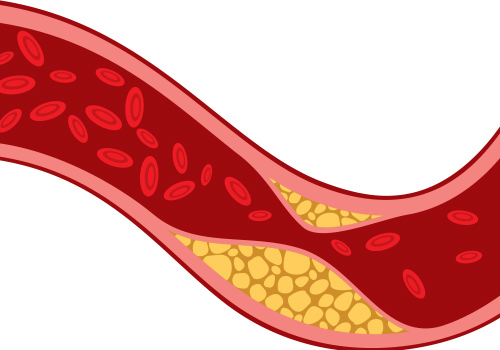 Over time, a gradual build-up of atheroma can narrow the arteries that supply the heart with blood. This process is called atherosclerosis and may eventually cause symptoms of angina or result in a heart attack or stroke. One cause of high LDL cholesterol is a diet high in saturated fat. If you have Diabetes, Heart Disease, Kidney Disease, or if you have had a Stroke your doctor may prescribe a lower cholesterol target level. A small portion of fat is needed in our diet, but fat is considered to be less healthy than other nutrients as is can raise our blood cholesterol, increase our risk to heart disease and are high in calories which can lead to weight gain. Some fats are healthier than others. There are three main types of fat in food: saturated fat, monounsaturated fat and polyunsaturated fat. A diet high in saturated fat can increase our ‘bad’ LDL cholesterol. Replacing saturated fat with unsaturated fats is an important dietary change to reduce cholesterol levels. You should avoid saturated fats wherever possible as these can raise your blood cholesterol level. Saturated fats are found mainly in animal products such as fatty meats, processed meats, full-fat dairy products, butter, coconut oil as well as cakes, biscuits, chocolate and many processed foods. Low-fat options have less saturated fat. Monounsaturated fats should be used in moderation. Using this type of fat may help reduce cholesterol levels. It is found in oils such as olive oil and rapeseed oil, olive oil based spreads as well as nuts and seeds. Polyunsaturated fats should be used in moderation. It is found in vegetable oils such as sunflower oil, nuts and seeds, polyunsaturated spreads, oily fish such as salmon, sardines, mackerel, trout and herring. Note: All types of fat are high in calories and can lead to weight gain. If you are overweight, aim for 1-2 pounds weight loss per week. Choose wholegrain varieties of cereal, bread, rice and pasta. Limit red meat to maximum three times per week. Red meat includes beef, lamb, pork, veal and venison and ham. 1 portion of red meat should be no bigger than the palm of your hand. Make sure the red meat is lean and well-trimmed of visible fat. Choose fish twice per week, with at least one day being oily. Examples of oily fish include sardines, mackerel, trout, herring or salmon. These foods are high in omega 3 oils which are good for your heart. Choose low-fat dairy products e.g. low-fat milk, low-fat yogurt, low-fat cheese. Remember low fat dairy has the same amount of calcium as full-fat dairy. Focus on getting your calcium from low-fat milk and yoghurts, as opposed to cheese. Limit cheese to less than two matchstick box size of cheese (approx. 30g) per week. Eat no more than 4-6 eggs per week. Choose heart healthy oils when cooking e.g. rapeseed oil and use sparingly. Choose a low-fat polyunsaturated or monounsaturated spread and spread it thinly. Limit foods and drinks high in fat, sugar or salt (crisps, biscuits, chocolate, soft drinks). If you drink alcohol, drink in moderation by keeping within the recommended weekly limits, which are 17 units for men and 11 units for women. Excessive alcohol can increase a type of cholesterol called triglycerides. Alcohol intake should be spread out over the week, aiming for at least two alcohol-free days per week. Aim for 150 minutes of moderate-intensity exercise per week. This can be broken down into 30 minutes on 5 days per week, or bouts of 10 minutes accumulated over the day. Posted in Health BlogLeave a Comment on Cholesterol: What is it and how can I manage it? 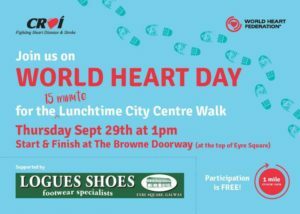 Local heart & stroke charity Croi are calling on all workers in offices and businesses in Galway city centre to take 15 minutes of their lunchtime on Thursday September 29th to join the Croi World Heart Day ’15 Minute’ Lunchtime Walk through the city. 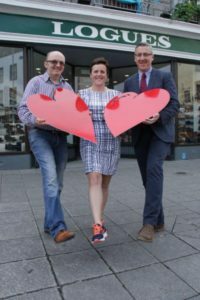 Pictured announcing their support for the Croi World Heart Day ’15 minute’ Lunchtime City Centre Walk from Eyre Square at 1pm on Thursday September 29th are: (Left to right) Rochie Tynan, Manager Logues Shoes (Sponsors), Edwina Treacy, Fundraising Manager Croi and Joe Kavanagh, Corporate Relations Manager Croi. Posted in NewsLeave a Comment on All in a day’s work! This program is intended for a complete beginner, so as long as you are injury free and in relatively good health you should have no problems with getting through this challenge. Please consult your GP prior to partaking in physical activity just to be on the safe side. Remember to always stretch and warm up correctly before you exercise and a good cooldown stretch at the end to ensure your muscles keep there suppleness and you don’t get to sore. Choose the right clothing and footwear, its not a bad idea to get online and look at some independent reviews if you are unsure on what is adequate. Also remember this is Ireland so make sure to wear good bright colours so you can be seen on those dark evenings. If you can, have a small snack no less that 45 minutes before your training and a good meal post exercise. This will help with stopping any muscle soreness. Try and keep your diet as clean as possible, just like your car, if it is filled with dirty fuel it just wont work the same. Your body is no different from this, so plenty of greens fish, nuts, berrys and some fruit. Try and stay away from sugary drinks (this includes isotonic drinks). Ultra marathon runners and long distance cyclists wont take on such drinks until after 1hr 45min of training so this will give you a rough idea of the level you need to be at to require these drinks. That been said, stay well hydrated with some good old H2O. The very best of luck.just remember this is not to set records, its to get you to complete your first 5k. DAY4: For 20 minutes you will jog 200m then walk 200m repeat,keep this up for the entire 20 minutes, when the 20 minutes is up, walk for 15 minutes then do your cool down stretch. Any questions don't hesitate to message our event page and we will get in touch! 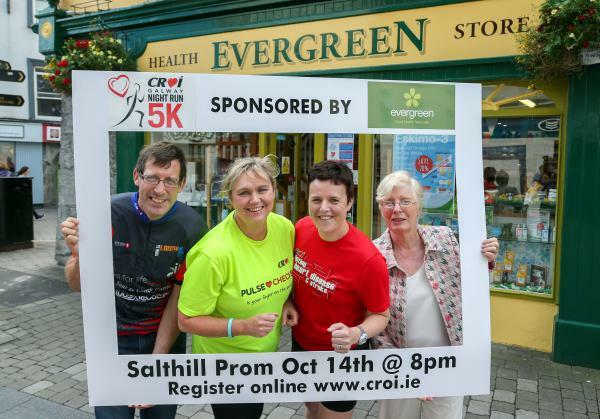 Don't forget to register for Croi Galway Night Run – October 14th @ 8pm! Local Charity Recognises Exceptional Community Support! Less than a year after Anthony O Brien, a young man who was Manager of the Corrib Oil service station and store in Ballinasloe, Co Galway died suddenly from a heart attack, his wife, parents, friends and neighbours came together to arrange a memorial fundraising cycle in aid of Croi. The event which took place in May this year attracted over 200 cyclists who cycled from Athlone to Galway raising the phenomenal sum of €95,000. Such was the popularity of the young man and his family that support for the event was received from far and wide throughout county Galway and Westmeath. 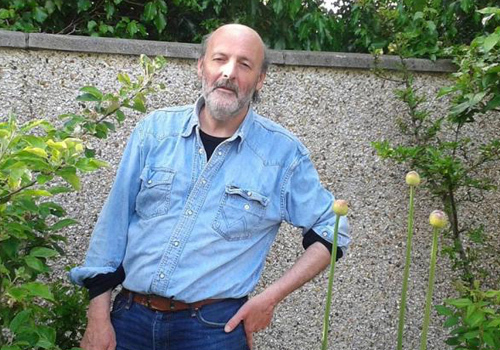 Anthony lived in Athlone with his wife Deirdre and their young daughter Ellie but his father Kevin O Brien is originally from Killimor Co Galway and his wife Deirdre is a palliative care nurse who trained at Galway University Hospital. 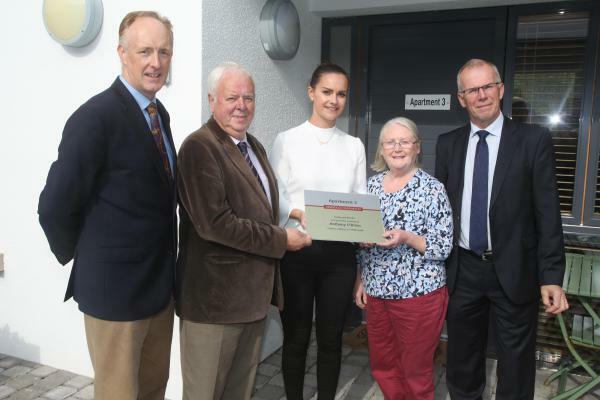 In recognition of this enormous donation to the fight against heart disease & stroke, Croi hosted a reception at the Croi Heart & Stroke Centre last week where one of the patient support apartments at the centre was dedicated to the memory of Anthony O Brien. The naming ceremony was attended by both the O’Brien and Mannion families and members of the memorial cycle organising committee. Posted in NewsLeave a Comment on Local Charity Recognises Exceptional Community Support! “This is a totally fun event over a distance of 5km which is aimed at people of all ages and abilities -the Salthill Promenade is one of Galway’s greatest amenities and we are delighted to be supported by local Galway company Evergreen Health Foods in promoting exercise & fitness while at the same time raising funds to fight heart disease & stroke” says Croi’s Event Manager Edwina Treacy. “We are proud to be this year’s main sponsor. This event fits our company ethos perfectly. At Evergreen, we are big believers in achieving good health naturally through a healthy diet and active lifestyle. So sponsoring such an amazing event that helps to raise much needed awareness of heart disease and stroke is something we can really get behind” says Patrick Carroll Evergreen’s Marketing Manager. Entries are now open for the Croi Night Run on www.croi.ie. Entry fee is €35 and each participant will receive a high quality reflective running vest and a Croi branded neck muff. Pictured at the launch of this year’s Croi Night Run on the Prom, photo shows (L to R) Brendan Sheehan, Edwina Treacy and Annie Costelloe Croi and Aideen Hurley Evergreen (Sponsor).